Found some old photos of when I was /P in North Wales. Posted on G-QRP club looking to see if anyone interested in playing chess by radio during the G-QRP Winter Contest.... had a few odd replies and couple off list emails and looks like might be some interesting radio this Xmas. Haverford College on the east coast of the USA was home to some of the earliest college radio experiments, including inter-continental chess matches and quizzes in the 1920s and 1940s. 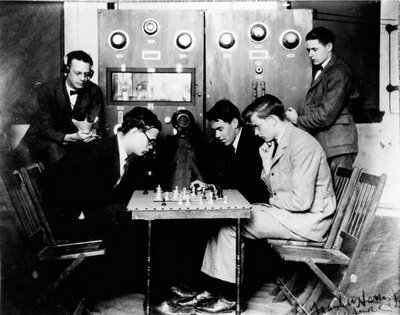 In December 1924, Haverford College and Oxford University had the first international chess match by amateur radio. In 1926, they again held a chess match by radio, this time with students from the University of Paris. Was asked what does the workshop look like now.... so here are some photos of just the build and test benches.